Buñuelos generally speaking it is sometype of fried dough, that can be stuffed, is either sweet or savory, and can be doused in syurp or sugar depending on the preparation (yes I know that is a very broad definition but buñuelos vary so much from culture to culture that I believe there is no solid definition of what a buñuelo should be). 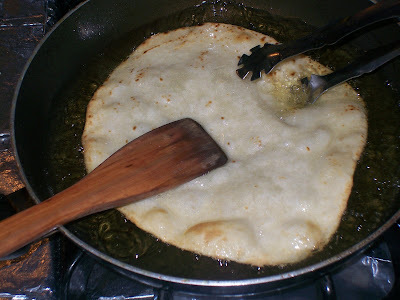 For example in Cuba, there is Buñuelos de Yuca (it's a fried dough made from Cassava root shaped as an 8 that is then dunked in syrup) and there is also different varieties of within a country like in one of my Salvadorian cook book there's a recipe for buñuelos it's made from rice flour and fried in the shape of a ball then dunked in a cinnamon infused syrup made from unrefined solid cane sugar. Some are even savory I've seen mixes sold at store to make "Buñuelos de Espinaca" (Spinach Bunuelos) and some Spaniards prepare Buñuelos de Manzana (apple bunuelos in which apple slices arre dunked in batter, fried then dusted with sugar) so I think by now we get point it can vary A LOT. 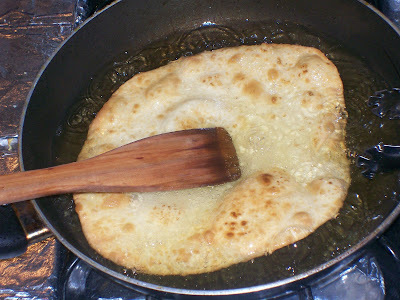 (1)In a large frying pan add about 1 inch worth of oil, heat it on medium high until it's sizzling (test with a wooden spoon if it bubbles it's ready) now add flour tortilla and push down as it floats up, when golden on one side flip and cook on the other side. When golden brown remove and drain. *They remind me of the Spaniard "Tortas de Aciete" they are round flat type of fried dough, fried in olive oil, dusted in sugar. My Abuelita's bunuelos have never had any egg in them nor have my mother-in-law's. Authentic bunuelos are not just deep fried tortillas. You have to make your own dough, which is thinner and sweeter than the typical flour tortillas. What part of Mexico are you from? Down here and the one most Mexicans I associate myself w/ know and expect is this version when they ask for a Bunuelo, the stores down here and households make it this way as well, to us Bunuelo is a flour tortilla that is deep-fried and coated in cinnamon sugar... my mom makes her own flour tortillas... doughs w/ eggs, yeast, and flavoring are not favored here for that type of stuf. Do you have the recipe? and where do you eat these "authentic" bunuelos? anyone have a recipe for bunuelos that use the skins from the tomatillos to make the dough elastic? my mother-in-law in Mexico City makes them that way but I don't have the recipe. I have NEVER made flour Tortillas with egg and I nobody I know has ever made them with egg!! I don't have exact measurements but my mom always used cinnamon tea instead of hot water. The dough IS NOT the same as regular flour tortillas. Ummm yeah it is the same as the regular flour tortillas, it's just a dough of fat (lard or butter), flour, baking powder, salt, and warm water (guess in your case your mom replaced warm water with cinnamon tea) just a variation I guess. They are gonna be dowzed in cinnamon sugar anyways. Sometimes instead the dough for the flour tortillas isn't even cooked just flattened and deep-fried, or you can use already cooked ones. My mom makes them just as you would regular flour tortillas but less lard. Roll out the tortilla and cut in squares with a slit in the middle. 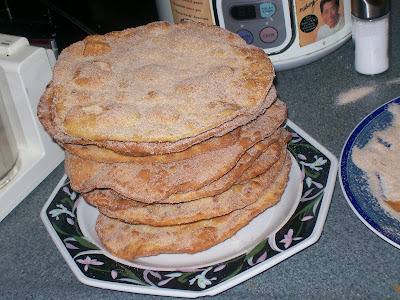 The bunuelos come out crispy on the outside and airy in the inside (the sides split apart). Eat with home made whole beans and raw white onion. Yum. That is my birthday meal I ask for every year. THAT IS NOT BUNELOS YOU DUM PRICK!!!!!!!!! Okay, how rude is it to call someone names on their blog? You may disagree-he said those were the ones he's familiar with. My parents (from Durango and Chihuahua Mexico) had a little different recipe that does involve orange zest and the dough is thinner. Okay Nathan. Let's ignore all the negativity, and the haters. As a working mom I can appreciate any shortcut that is as delicious as doing it the “authentic” way. I would like to know if you know how to make the piloncillo sauce that goes with the buñuelos? As the title states>>> "Buñuelos Mexicanos (Mexican Buñuelos)". Can't believe that is difficult to understand. 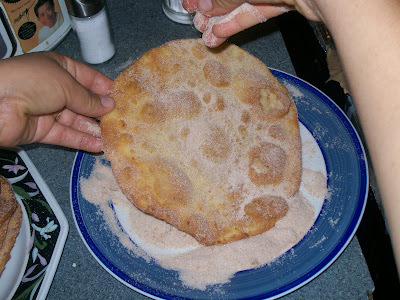 The author of this blog is showing a regional version of buñuelos, created with ingredients used in that region. I am Tex-Mex meaning that I have distant relation to Mexico and more Native American features, words, and recipes. This recipe is what my familia considers everyday Buñuelos. The thicker ribbon strips with a slit lengthwise in the center and turned into itself was our "twisted" Christmas buñuelos. Yeah - No disrespect, but these are what one might call "rasquache" bunuelos - kinda the easy way of doing them. Bunuelos are actually made out of a batter that's thinner than pancake batter. They are then deep fried in a mold and sprinkled with cinnamon sugar or powdered sugar. I'm from San Antonio, TX and all the ways that people have discussed making them, people make them that way here. I guess it's the amount of time you want to spend making them. I just bought a rosette kit to make them with the flower mold. And plus, they're not even Mexican, or Spanish for that matter. They're a tradition that was brought from Scandinavia when the Scandinavians migrated to Northern Spain. Then, the Northern Spaniards brought them to Mexico. It probably also depends on your own family traditions. Here in San Antonio, we have all traditions, both tex-mex, traditional Spanish, and even the Scandinavian because of the Germanic traditions that are also down here.BTW - my family comes from mostly the Norteno part of Mexico but I'm fourth gen. Texan. There's LOTS of variations for Bunuelos but atleast they're all fried, pretty one the one I made is the type that's a flat round disk, deep-fried then cinnamon sugar coated, everyone makes the dough different or have variations this is jus how my family does it. I'm 1st generation born here from my mom's side (Mexican), and 2nd from my dad's (Spanish-Cuban) trust Bunuelos can VARY a grip load, when i go to Cuban friends houses the Christmas Bunuelos are actually thick doughnut fritters the shape of an 8 made out of Malanga, Yuca root and sometimes other root vegetables with flour, egg and anise, drizzled with heavy cinnamon, lemon peel, and anise infused syrup made. So I'm not surprised there's so much differences. I'm just annoyed by the dumbasses that commented thinking there's only one way to make Bunuelos or one true method, but I'm nice enough not to moderate lol. cuz well I like to give people the freedom to express themselves ha ha. Well as a MEXICAN, from, you know, MÉXICO, this is the only way I've ever known them. Texan buñuelos? Sorry but "Tex-Mex" is Texas version of Mexican, not Native American. I know that part as a former Texas resident...Gracias a Dios that I live in California now! I love all forms of bunuelos and I don't feel that one is more authentic than the other. Although I think it would make more sense to call the Mexican ones tostadas dulces or something. How it went from fritter to flour tortilla is beyond me. Again, I'm not hating, my mother is Mexican and making them right now. She's looking for a recipe with tomatillo rinds and that's how I came upon this blog. In Spain Bunuelos vary alot, my grandma is from Madrid & grandfather Cuban born but family from Catalunya, and I have friends from San Sebastian, also in Valencia they are donut shaped and can be made with just flour, yeast, and water popular during "Las Fallas" celebration dusted in sugar, in addition Bunuelos de Calabaza are also very popular in Valencia during "Las Fallas" those have egg either, BUT the "Bunuelos de Viento" made from choux pastry, they're like deep-fried puffs stuffed with cream or chocolate, etc. those do have egg, fellow Galician blogger makes "Bunuelos de Manzana" and also the ones that are "Flores de Carnaval" those have egg but not all of them do. & yeah in Spain "TOrtilla" is an omelette, they call it tortilla because it's like a round cake, etc. and the word started to be used in Mexico and other Latin countries for anything that was like a round disk, like the full name of Mexican corn tortilla is "Tortilla de Maiz" then the flour one is "Tortilla de Harina" and the Spanish tortilla is also made in Mexico called "Tortilla de Patatas" or "Tortilla Espanola", etc.but people just shorten it to Tortilla because usually they are speaking to people of similar culture who already know what htey are talking about without being specific. My daughter makes these all the time and all her "white" friends love them! Is there anyway I can follow your blog? I don't see the link...it may be right in front of me and I don't see it! Hehehe! I make my syrup with piloncillo by boiling it in water with 2 cinnamon sticks & a little bit of clove. My mom was from Sonora & she made 3 types of buñuelos; she made the rosette type in which the dough is pancake like, she sometimes fried store bought tortillas or she made the masa similar to the flour tortilla except she did add egg and a little bit of vanilla. I recall the masa being slightly yellow. Sometimes she covered them with sugar & cinnamon or poured the syrup on them. Delicious! 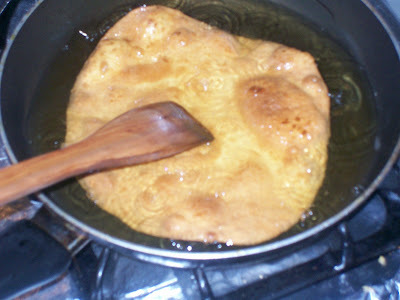 Buñuelos made with a rosette iron are called "Buñuelos de Viento". Buñuelos made in the central part of Mexico are sometimes called "Buñuelos de Rodilla", because the dough (NOT tortilla dough, and absolutely not store-bought flour tortillas!) is shaped by stretching it over your knee (covered by a tea towel) to make a big round shape. Some women prefer to use a big round-bottomed clay bean pot instead of their knee to stretch the buñuelo. The raw buñuelo is then fried in oil and served with either a dusting of cinnamon sugar or broken up into a bowl with piloncillo syrup poured over it. For more information and lots of images, google buñuelos de rodilla. It's really important to realize that there are regional differences in many common Mexican dishes. This discussion of buñurelos is a good example. Whatever you're used to is 'tradition' for you, but it might sound totally wrong to someone else.